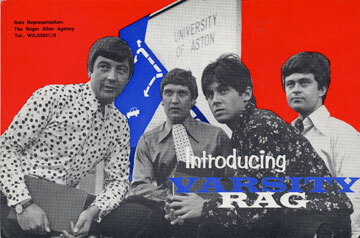 The photo (above) taken in July 1967 near Aston University, shows the original Varsity Rag line-up. From left to right we have, Ken Horden, Jon Fox, Mick Lawson, and Brian Nicholls. Although of Birmingham origins, Varsity Rag were managed by Wolverhampton's Roger Allen Agency - later to merge with Astra to become Astra-Allen. The band members had all played in various local groups. Jon Fox was formerly of Jon Fox and The Hunters, The Way Of Life, Johnny Neal and The Starliners, and The D'Fenders. 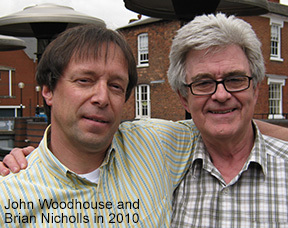 Brian Nicholls was formerly of The Fleetwoods, The Shanes, The Little People, and The Capitals. Mick Lawson was formerly of The Shanes and The D'Fenders. Ken Horden's former bands were The Nighthawks, The Lawmen, The Shanes, and the highly respected Modernaires. Following their first gig in the Wolverhampton area - The Staffordshire Volunteer at Bushbury on 1st July 1967, Varsity Rag were quickly "adopted" by the locals as a Wolverhampton group even though a healthy number of gigs for the band were in Brum via agents John Singer and Pete Gittins (Barr Enterprises, Great Barr, Birmingham). Apart from routine 'bread and butter' gigs, the group often shared the billing with such famous names as The Searchers, Fleetwood Mac, The Animals, Crazy World of Arthur Brown, The Nice, Jimmy Cliff Explosion and Long John Baldry. These gigs were played at such venues as The Park Hall Hotel - Wolverhampton, The Kingfisher Country Club - Kingswinford, Wolverhampton Civic Hall, plus of course, the prestigious Northern variety clubs circuit when they would perform a fifteen minute spot. When the band played at Manchester, they would do 15 minutes at the "Princess" and then off to do the "Domino" for another 15 and then back home! Varsity Rag were unashamedly a 'covers' band (but then so were The Beatles when they set out!). Nevertheless, the set-list featured a handful of fine songs from the pens of Jon and Mick. The original line-up were all inspired by the Spencer Davis Group. Spence and the boys were once voted by Midlands musicians in a Midland Beat magazine poll as... "The group's group". Says Brian; "We liked the fact that the Spencer Davis Group actually played their own instruments on records unlike many of the locally signed groups who had to endure session men and string arrangements in the form of pre-recorded backing tracks." Actual gig records for Varsity Rag exist from June 1967 to December 1968 and show that during this period alone, the group performed a total of 351 gigs - some of these comprising of three gigs in one day! i.e. lunchtime, evening plus a night club (e.g. the Rum Runner - Broad Street, Birmingham). These days, groups are lucky to get more than one gig a month! Notably, on 19th September 1967, Varsity Rag appeared at 'Dance of The Year' at Wolverhampton Civic Hall - sharing the billing on equal footing with The Montanas, The Californians, The N'Betweens (later to become Slade! ), Finders Keepers, and Hari Kari. The ticket-only event was billed as "The Top Six Bands of The Midlands". The evening ran from 8 pm to midnight and tickets cost 7 shillings and sixpence (37 1/2p in today's money). Groups in those days were much quieter compared to today due to more 'modest' equipment like 30 watt VOX amps (same as The Shadows!) and a 150 watt PA system - no fold-back monitors (so you had to listen to each other). All of this along with the guitars, drums, and band members would be packed into the ubiquitous Ford Transit van. 'Name bands' were also using the same type of gear because 1000 watt rigs had not yet been thought of. Set-up times at the gigs had to be quick if you were sharing a bill. Groups would arrive from another gig to do their set and would be expected to set their gear up and be ready to go in less than 15 minutes whilst a DJ filled in, and then be off again just as fast to do another gig. There were no sound checks - even at the 2,000 seat Northern variety clubs or the exclusive Scotch of St. James' in Mason's Yard, London. 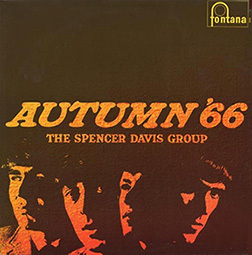 Varsity Rag recorded four tracks at Domino Sound Studio, Albrighton, in 1968 under the 'supervision' of London producer Irving Martin (who produced records by Finders Keepers and The Californians). The tracks were Gypsy Girl, Battle Of Farthing Green, and Highway Blues (all written by Mick), plus a cover of Hopeton Lewis' Rock Steady. Musically speaking, Varsity Rag were a very tight proficient group who could 'prop up the bar' with the best in the business, so when Irving Martin spoke of doing "large productions" on each number, a disagreement arose and the recording contract slipped away - as did the management charisma when the Roger Allen Agency was absorbed into Astra. Varsity Rag played their final gig at Bromsgrove Baths on New Year's Eve, 1970 - the eventual line-up being Ken Horden, Max Griffiths, Mick Lawson, and Barry Hinks. 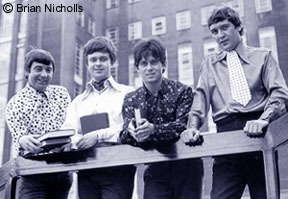 During 1970, the group had secured a residency at the Spiders Web night spot in Walsall in addition to the regular gig circuit. However, this circuit was very much depleted compared with its heyday during the mid to late 1960s. Jon Fox left Varsity Rag in 1968 to form Cathedral and was replaced by Barry Harris on bass. Brian Nicholls left in December of 1968 and was replaced by Max Griffiths of The D'Fenders on lead guitar. Mick Lawson left in April 1969 to be replaced by Laurie Hornsby - the same Laurie who went on to write two excellent books Brum Rocked! and Brum Rocked On!. Laurie left in October 1969 whereupon Mick re-joined the group. Ken Horden, who was by this time, the only remaining original member of Varsity Rag, stayed on until the end. He later joined Jason Cord. Ken has long since hung up his sticks but still performs regularly as a cricket umpire! Mick Lawson went on to form 'Evensong' - a duo who toured America and Europe to promote an album and single. He still performs and records under the name of "Emitt Till". Thanks to guitarist and local rock music historian Brian Nicholls for supplying this exclusive story of Varsity Rag. Brian is a regular contributor to the BrumBeat web site.